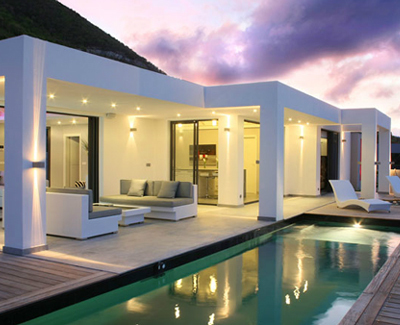 Beautiful contemporary 2 bedroom villa close to Orient Bay. Pearl is a newly constructed contemporary style, comfortable 2 bedroom villa with views east to Orient Bay, the Atlantic and the sun rise. Located in the gated community of Mont Vernon Plantation, Pearl is fully air conditioned and offers all the modern conveniences to ensure an idyllic stay. Comprising a living, dining & kitchen area that open out on to the covered terrace offering further dining for up to 6 guests. Both interior access, air-conditioned bedrooms have a king-size bed and a complete en-suite bathroom. The Master bedroom also features a private garden area with sun lounger . The long lap pool with wide entrance steps and river rock finish runs almost the length of the villa. The villa is fabulously fiber optic lit at night, and is a fine example of a compact architectural masterpiece. This is a wonderful new villa is ideal for either 2 couples or for a family of 4. The villa is located within a 5 minute drive of The Palm Beach Restaurant on Orient Beach .